When it comes to joint pain, no one solution works for everyone! That’s so important, I’m going to repeat it one more time. No one solution works for everyone! Joint pain is an interesting animal. Everyone has it at some point. For many people, it’s only an occasional problem — easily taken care of by a single aspirin or some Ben Gay (or herbal deep tissue oil for that matter). For others, though, it’s a chronic problem, reducing them to a lifetime of dependency on high doses of NSAIDS or prescription drugs. Over the years, I’ve formulated and recommended a number of products for pain. Years ago, before they were all the rage, I recommended Glucosamine and Chondroitin sulfate. Also, over the years, I’ve recommended CMO (cetyl myristoleate), MSM, fish oil, boswellia, and proteolytic enzymes, among others. Because no one solution works for everyone! That’s so important, I’m going to repeat it one more time. No one solution works for everyone! I don’t care what advertising statements you’ve read or how hard someone has tried to sell you a magic bullet, no one formula works for everyone. Each person is unique. Their bodies are different. And the causes of joint pain and cartilage destruction are varied. If Glucosamine and Chondroitin already work for you, then this report is not for you (necessarily). If CMO does the trick, same thing. If you’re happy with proteolytic enzymes or herbal deep tissue oil, this probably is not for you (most likely). But if they haven’t worked, or if you still suffer from chronic pain, and the only help you’ve been able to find is from daily doses of aspirin or prescription drugs, or if you’re concerned about more than just the pain issue and are looking to prevent further degradation of your joints, then read on. With that in mind, let’s look at the formula in question from top to bottom. Aggrecan plays a crucial role in the functioning of articular cartilage (the cartilage found in joints), primarily working to maintain high levels of hydration in the cartilage–thereby keeping the cartilage healthy and functional. As a side note, it is the presence in aggrecan of large numbers of chondroitin sulfate chains that is primarily responsible for the osmotic pressure that results in articular cartilage being 75% water. If you’ve tried Chondroitin sulfate, Glucosamine sulfate, MSM, CMO, whatever, and none of them have worked for you, then ASUs offer an exciting alternative. It turns out, there may be another benefit to ASU supplementation. It is now understood that one biochemical in particular is responsible for the erosion of oral structures–literally eating away at your jawbone and the ligaments that hold your teeth to your jaw. This oral toxin is called Interleukin-1beta (IL-1beta), and it has been referred to as the “common mediator of the inflammation process.” Your body’s countermeasure to IL-1beta is a family of biochemicals called “Transforming growth factor-beta.” TGF-beta has been identified as one of the factors capable of counteracting IL-1beta’s destructive effects and plays a key role in tissue regeneration. Unfortunately, one of the effects of IL-1beta is that it inhibits the production of TGF-beta, the very substance that can counteract it and repair the damage. Luckily we have ASU. And finally, a third French Study showed that avocado and soybean unsaponifiables protect all types of gingival elastic fibers from degradation by HLE.6 Kut C, Assoumou A, Dridi M, et al. “Morphometric analysis of human gingival elastic fibres degradation by human leukocyte elastase protective effect of avocado and soybean unsaponifiables (ASU).” Pathol Biol (Paris). 1998 Sep;46(7):571-6. http://www.ncbi.nlm.nih.gov/pubmed/9842576 HLE is one of several hydrolytic (water removing) enzymes contained in neutrophils. Physiologically, it digests foreign material ingested by immune cells. However, when triggered by the inflammation and infection associated with gingivitis, it attacks the elastic and preelastic fibers that help hold your teeth in place. This destruction is a hallmark of periodontal disease. Thus the study concluded that ASU may be beneficial in patients with gingival inflammation and periodontitis since HLE plays a major role in these disease states. Although ASU works directly to build and repair joint cartilage, it doesn’t address a major aspect of the problem (in fact few things address this particular aspect). A key component of most joint destruction (sometimes an initial cause as in rheumatoid arthritis and sometimes a secondary factor triggered by an initial trauma to the tissue as in osteoarthritis) is when the immune system goes out of control and starts attacking the cartilage. In other words, once a person starts down the road of joint pain, either early on or later in the process, at some point the immune system usually “goes wrong” and becomes a factor in the gradual destruction of joint tissue. Literally, the immune system reprograms itself to treat joint tissue as a foreign invader and “eat it up.” Re-reprogramming the immune system through the use of immunomodulators is often an essential step in stopping and reversing this damage. In the past, I have recommended several immunomodulators including CMO (cetyl myristoleate) and L-Carnosine, but UC-II seems to represent a choice uniquely suited to dealing with joint and cartilage problems. Although this discussion ultimately applies to all forms of joint damage, for the moment, let’s focus our attention specifically on rheumatoid arthritis. Rheumatoid arthritis (RA) is a common autoimmune disease in which killer T-cells of the body’s own immune system (most likely triggered by invading bacteria) reprogram themselves to attack joint cartilage, resulting in inflammation and joint destruction. The current treatment strategies of suppressing immunity and inflammation offer only limited success. “Oral tolerance,” on the other hand, is a long-recognized mechanism for inducing immune tolerance–that is, suppressing a misdirected immune response. But rather than suppressing the entire immune system, oral tolerance targets specific immune cells responsible for tissue damage. Inducing the immune system to tolerate joint cartilage, rather than identifying it as a “foreign” substance, requires a specific sequence of events to take place within that part of the immune system found in the gastrointestinal tract lining. Studies have shown that small doses of undenatured type II collagen can indeed trigger this particular sequence of events, thereby deactivating killer T-cell attacks of joint cartilage in humans.7 Bagchi D, Misner B, Bagchi M, et al. “Effects of orally administered undenatured type II collagen against arthritic inflammatory diseases: a mechanistic exploration.” Int J Clin Pharmacol Res. 2002;22(3-4):101-10. http://www.ncbi.nlm.nih.gov/pubmed/12837047 Other studies have demonstrated that the undenatured type II chicken collagen found in UC-II retains its activity when exposed to human digestive fluids, which is not necessarily true of other sources. Time-dose measurements by ELISA immuno-assay of UC-II activity have shown that it retains approximately 50% activity even after as long as 90 minutes after exposure to digestive juices. Most type II chicken collagen sold in dietary supplements is denatured, or hydrolyzed, which is another way of saying that the chemicals and high-heat used to process and refine it have changed its molecular configuration. An undenatured extract is made using little or no heat and limited processing. It is usually extracted using pepsin with just enough processing to concentrate the collagen and make it soluble. Denatured or hydrolyzed extracts, on the other hand, typically use high heat, acids, and enzymes to make the protein molecules more soluble; but these methods fundamentally alter the structure of the protein. Denatured proteins are often called hydrolyzed proteins–thus denatured collagen is often called hydrolyzed collagen. This does not make it useless. Hydrolyzed type II chicken collagen still has value as a source of some of the components of aggrecan, including collagen itself, hyaluronic acid, chondroitin sulfate, and glucosamine. But to receive this benefit you need to consume it in large amounts, as much as 3-10 grams a day. But more importantly, one significant thing does change in the process of denaturing. When denatured, type II chicken collagen loses its immunomodulating ability. Type II collagen must be in its native (undenatured) form to be effective in this capacity. UC-II is extracted from chicken sternum cartilage using a patented, low-temperature process that ensures the undenatured biological activity of the type II collagen even when exposed to digestive juices for 90 minutes or more. As mentioned earlier, undenatured collagen administered orally works with the immune system to promote healthy joints by a process called oral tolerization. This process helps the body to differentiate between foreign invaders, such as bacteria, and elements that are good for the body, such as nutrients. The process of oral tolerization takes place in the small intestine where food is absorbed. Through a complex process, lymphoid tissue in the mucosal lining of the small intestine screens incoming compounds and serves as a “switch,” turning the body’s immune response on or off to foreign substances, depending upon what that substance is. In the case of undenatured type II chicken collagen, small amounts (typically around 10 milligrams) taken orally have been shown to correct a faulty immune response specifically targeted at the type II collagen present in bone joint cartilage — in effect, modulating the body’s immune response so it works correctly once again. At a cost of over $17,000 per kilogram of active ingredient, UC-II is undoubtedly the single most expensive ingredient I have ever used in a formula. Fortunately, it only takes 10 mg a day of its active ingredient for maximum effect. (In fact, it loses effectiveness if too much is used, losing all effectiveness at levels over 20 mg a day). But cost aside, the fact that it specifically addresses the problem of the immune system destroying the body’s own cartilage mandates its inclusion in the formula. When we talk about a 10 mg dose, we’re talking about 10 mg of active glycosylated undenatured type II chicken collagen. But there are no readily available pure sources of this component. Standard hydrolyzed chicken collagen, as explained earlier, has virtually none. And most sources of undenatured collagen offer it in the range of 10-25% concentrations. In UC-II, for example, active glycosylated undenatured type II chicken collagen comprises 25% of the whole. That means it takes 40 mg a day of UC-II to get 10 mg of active undenatured collagen. I have noticed that several of the supplement providers who are using UC-II in their formulas have mistakenly used 10 mg of UC-II itself. That means they are only providing 2.5 mg of active undenatured collagen. Given the cost, I can see why, but from your perspective, you want a full 10 mg, which requires 40 mg a day of UC-II– or more from other sources. Ginger is a COX-2 (Cyclo-Oxygenase-2) inhibitor. The COX-2 enzyme plays a key role in the inflammation process, which is a normal, healthy attempt by the body to heal itself. However, when inflammation gets out of control (such as in the case of arthritis or other chronic inflammatory disorders), ongoing pain and discomfort is the result–not to mention that systemic inflammation is considered to be a contributing factor to catastrophic illnesses such as heart disease and cancer. A botanical COX-2 inhibitor such as found in ginger can block the action of the COX-2 enzyme in much the same way as prescription drugs do, but without the side effects. There are two COX enzymes present in the human body, COX-1 and COX-2. The COX-1 enzyme is found in most tissues and is necessary for a variety of important internal functions, such as protecting the stomach lining, maintaining renovascular function, and platelet aggregation. The COX-2 enzyme, though, has an entirely different function. It is a necessary component of the inflammation process, which is a normal, healthy attempt by the body to heal itself. However, when inflammation gets out of control (such as in the case of arthritis or other chronic inflammatory disorders), ongoing pain and discomfort is the result. Prescription COX-2 inhibitors such as Vioxx and Celebrex have proven helpful in relieving out of control inflammation and its accompanying pain — but with notable side effects such as an increased risk of heart attacks and strokes.11 “Celebrex, Vioxx and Bextra News.” Consumer Affairs. (Accessed 11 May 2015.) http://www.consumeraffairs.com/celebrex-vioxx-and-bextra-news That’s where botanical COX-2 inhibitors such as ginger can help. Botanical COX-2 inhibitors block the action of the COX-2 enzyme in much the same way as prescription drugs do, but without the side effects. A twelve month placebo-controlled, double-blind, crossover study published in Osteoarthritis Cartilage magazine (no really, that’s its name) tracked 29 patients with painful arthritis in the knee (6 men and 23 women ranging in age from 42-85 years).15 Wigler I, Grotto I, Caspi D, Yaron M. “The effects of Zintona EC (a ginger extract) on symptomatic gonarthritis.” Osteoarthritis and Cartilage November 2003 Volume 11, Issue 11, Pages 783–789. http://www.oarsijournal.com/article/S1063-4584(03)00169-9/abstract By the end of the first six months, those given ginger were experiencing significantly less pain on movement and handicap than those given placebo. Pain on movement decreased from a score of 76.14 at baseline to 41.00, while handicap decreased from 73.47 to 46.08. In contrast, those who were switched from ginger to placebo experienced an increase in pain of movement (up to 82.10) and handicap (up to 80.80) from baseline. In the final phase of the study when all patients were getting ginger, pain remained low in those already taking ginger in phase 2, and decreased again in the group that had been on placebo. Not only did participants’ subjective experiences of pain lessen, but swelling in their knees, an objective measurement of lessened inflammation, dropped significantly in those treated with ginger. The mean target knee circumference in those taking ginger dropped from 43.25cm when the study began to 39.36cm by the 12th week. When this group was switched to placebo in the second phase of the study, their knee circumferences increased, while those who had been on placebo but were now switched to ginger experienced a decrease in knee circumference. In the final phase, when both groups were given ginger, mean knee circumference continued to drop, reaching lows of 38.78 and 36.38 in the two groups. The bottom line is that ginger’s anti-inflammatory benefits, which include reducing pain and inflammation, help minimize any further degradation to joint cartilage–thus allowing ASU an opportunity to repair existing damage without having to fight through new damage. Cetyl myristoleate (CMO) is the common name for cis-9-cetyl myristoleate. (You can think of it as a relative of the Omega-9 fatty acid found in olive oil.) It is a completely natural medium chain fatty acid found in certain animals, including cows, whales, beavers, and mice–but not in people. CMO was discovered in 1972 by Harry W. Diehl, Ph.D., a researcher at the National Institutes of Health. At the time, Dr. Diehl was responsible for testing anti-inflammatory drugs on lab animals. In order for him to test the drugs, he first had to artificially induce arthritis in the animals by injecting a heat-killed bacterium called Freund’s adjuvant. Dr. Diehl discovered that Swiss albino mice did not get arthritis after injection of Freund’s adjuvant. Eventually, he was able to determine that cetyl myristoleate was the factor present naturally in mice that was responsible for this protection. When CMO was injected into various strains of rats, it offered the same protection against arthritis.20 Diehl HW, May EL. “Cetyl myristoleate isolated from Swiss albino mice: an apparent protective agent against adjuvant arthritis in rats.” J Pharm Sci. 1994 Mar;83(3):296-9. http://www.ncbi.nlm.nih.gov/pubmed/8207671 There have been three notable studies on humans. In 2001, a study of 1814 arthritis patients found that over 87% of the subjects in the study had greater than 50% recovery and over 65% of those showed from 75% – 100% recovery following a sixteen day regimen. All types of arthritis were positively affected by CMO. Only those subjects with liver damage or digestive problems or those taking immune suppressing medications were not helped. Boswellia serrata, the Indian version of frankincense, has been a staple of Ayurvedic medicine from time immemorial for its ability to manage inflammatory disorders. Positive effects of boswellia in some chronic inflammatory diseases including rheumatoid arthritis,24 Umar S, Umar K, Sarwar AH, et al. “Boswellia serrata extract attenuates inflammatory mediators and oxidative stress in collagen induced arthritis.” Phytomedicine. 2014 May 15;21(6):847-56. http://www.ncbi.nlm.nih.gov/pubmed/24667331 bronchial asthma,25 Hamidpour R, Hamidpour S, Hamidpour M, Shahlari M. “Frankincense ( ru xiang; boswellia species): from the selection of traditional applications to the novel phytotherapy for the prevention and treatment of serious diseases.” J Tradit Complement Med. 2013 Oct;3(4):221-6. http://www.ncbi.nlm.nih.gov/pmc/articles/PMC3924999/ psoriasis,26 Togni S, Maramaldi G, et al. “A cosmeceutical formulation based on boswellic acids for the treatment of erythematous eczema and psoriasis.” Clin Cosmet Investig Dermatol. 2014 Nov 11;7:321-7. http://www.ncbi.nlm.nih.gov/pubmed/25419153 osteoarthritis,27 Gupta PK, Samarakoon SM, et al. “Clinical evaluation of Boswellia serrata (Shallaki) resin in the management of Sandhivata (osteoarthritis).” Ayu. 2011 Oct;32(4):478-82. http://www.ncbi.nlm.nih.gov/pmc/articles/PMC3361921/ ulcerative colitis and Crohn’s disease have been reported.28 Ammon HP. “Modulation of the immune system by boswellia serrata extracts and boswellic acids.” Phytomedicine. 2010 Sep;17(11):862-7. Epub 2010 Aug 8. http://www.ncbi.nlm.nih.gov/pubmed/20696559 Until recently, research on boswellia has focused almost exclusively on the boswellic acids, particularly AKBA (acetyl-11-keto-beta-boswellic acid) as the most active component in boswellia, and have looked to maximize that component. However, more current research has indicated that some of the water soluble polysaccharides in boswellia are also essential components in that they initiate and support the anti-inflammatory activity, whereas the lipid-soluble boswellic acids help to provide a sustained action. In fact, a particular boswellin polysaccharide extract known as Polysal has demonstrated a dose dependent anti-inflammatory potential, similar to the boswellic acids. But in addition to the active boswellic acids, Boswellin® PS contains Polysal, the exclusive water soluble polysaccharide components which contribute to an immediate anti-inflammatory action – perfectly complementing the more sustained action of AKBA. Polysal primarily consists of galactose, arabinose, D-glucuronic acid, and 4-o-methyl-glucuronoarabino-galactan. In a human study, boswellia was similarly shown to be effective in adults with osteoarthritis.30 Kimmatkar N, Thawani V, Hingorani L, Khiyani R. “Efficacy and tolerability of Boswellia serrata extract in treatment of osteoarthritis of knee–a randomized double blind placebo controlled trial.” Phytomedicine. 2003 Jan;10(1):3-7. http://www.ncbi.nlm.nih.gov/pubmed/12622457 Thirty subjects with osteoarthritis of the knee took part in a 16-week, randomized, double-blind, placebo-controlled trial. All of those who took a boswellia supplement reported less pain and swelling, increased knee flexion, and the ability to walk a greater distance. But it’s not just arthritis. Boswellia seems to have the ability to reduce all forms of inflammation. In studies, bronchial asthma was reduced in 70% of 40 patients treated with 300 mg three times daily for 6 weeks in a double-blind trial.31 Gupta I, Gupta V, Parihar A, et al. “Effects of Boswellia serrata gum resin in patients with bronchial asthma: results of a double-blind, placebo-controlled, 6-week clinical study.” Eur J Med Res. 1998 Nov 17;3(11):511-4. http://www.ncbi.nlm.nih.gov/pubmed/9810030 It has also proven effective in helping control the inflammation associated with Crohn’s disease32 Gerhardt H, Seifert F, Buvari P, et al. “[Therapy of active Crohn disease with Boswellia serrata extract H 15].” Z Gastroenterol. 2001 Jan;39(1):11-7. http://www.ncbi.nlm.nih.gov/pubmed/11215357 and colitis, as was mentioned earlier. 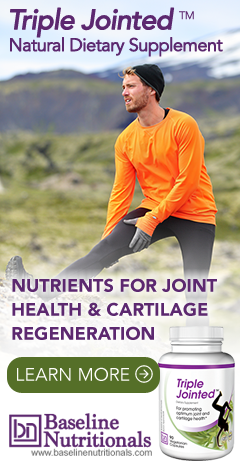 It makes use of the unique ability of the undenatured type II chicken collagen found in UC-II™ to train the body’s immune system to stop attacking joint cartilage. It makes use of ginger’s ability to directly reduce pain and inflammation. It makes use of CMO’s ability to lubricate joints, to support the rebuilding of cartilage, and stop the immune system from attacking joint tissue. Systemic proteolytic enzymes can be remarkably effective in reducing inflammation throughout the body. Reducing the inflammation can go a long way in stopping the damage from progressing any further — in addition to reducing the pain. Immune boosters and pathogen destroyers can actually assist in alleviating many types of joint pain. Once again, the “scientific community” is years late in acknowledging the commonly known fact that, in most cases, joint pain is related to a compromised immune system. Take rheumatoid arthritis, for example. The Journal of Clinical Pathology has finally endorsed what the Mayo Clinic demonstrated conclusively years ago: that bacteria are involved. And new research is indicating that mycoplasma infections may be responsible for as much as 50% of all chronic disease, including arthritis. Glucosamine and chondroitin sulfate are not a cure, but for some people 1,000-2,000 mg a day may provide some relief. Studies are decidedly mixed, but if it works for you, that’s all that counts. I’ve read all of your articles about the ASU formula but don’t know where to purchase your updated formula because you don’t give it a name. Please let me know where I can get it. Thank you. My husband suffered an aggressive and rare type lymphoma in the hip bone. He has been in remission for 2 years now. Due to this event his hip cartilage was eliminated – bone to bone – due to other health issues Hep C (low platelet) – hip replacement surgery has been postponed. I have been told, there is nothing to regenerate cartilage when is gone. But I will keep asking… His pain and inflammation worsen every day. Do you have any suggestion? Thank you for your generosity and time. Blessing to you! This article is some of the best information we have on the topic right now. You can also search for Hep C on our site for more research. You can find all of Jon Barron's recommended supplements on our Products page, and who sells them. For this one, look for Joint Enhancers. I looked in the products related to Joint Enhancers, but I couldn’t find the one that has in it the ASU. What is then the name of the product? I have R.A. but need a Hyaluronic Collagen that is not animal base since I am a vegetarian and do not eat or drink anything animal. I have sevire R.A. and Lupus, can you tell me what to take and if they have anything in just one bottle? Thanks. I am wondering what the reply is to the vegetarian who has R.A. and Lupus. What can she take that is not animal based but will help? Use 20 Mule team borax. I cured my RA within one month. For first 19 days I could feel no effect then day 20 I could feel the stiffening dissipating. Put 1/8 to 1/4 teaspoon in lukewarm water to dissolve it then drink it on empty stomach one a day. It works for 70% of the people. We have not seen any evidence either pro or con concerning the efficacy of Chicken Collagen Type 2 with reactive arthritis. If you try it, please report back and let everyone know the result. I did not see any solutions for heavy mycoplama infections that cause inflammation and connective tissue issues. I don’t want to go the heavy antibiotic route. Jon says above in this article: "Immune boosters and pathogen destroyers. Once again, the "scientific community" is years late in acknowledging the commonly known fact that, in most cases, joint pain is related to a compromised immune system. Take rheumatoid arthritis, for example. The Journal of Clinical Pathology has finally endorsed what the Mayo Clinic demonstrated conclusively years ago: that bacteria are involved. And new research is indicating that mycoplasma infections may be responsible for as much as 50% of all chronic disease, including arthritis." I’m intrigued. I’ve suffered with chronic joint pain to the point of left hip, and both knees being replaced. I feel I’m fast approaching a right hip replacement along with degenerative back problems as well. I’m looking forward to trying this out with hope of a brighter future. The only things that worked for me were water fast, wheat grass of other raw greens (like barley), or a raw diet. The above also took care of a severe case of psoriasis when nothing else would. I have osteopenia and I have been told I have osteoarthritis of my shoulder and should have a shoulder replacement. I also am estrogen receptor positive. Would taking this supplement be advised since I was told not to ingest any type of soy protein after I was diagnosed with breast cancer 11 years ago? You would certainly want to talk to your doctor before taking any supplement, but there is absolutely no soy protein or soy estrogens in this formula – only one particular form of fat found in soy known as an unsaponifiable. Never heard of that word before. Would you think this product would benefit me? As on all supplement labels, the amounts listed are for serving size, not single capsules. As the label says, a serving size is 3 capsules. You’re getting 10 mg of active UC-II per 3-capsule serving. Nothing wasted. I have read about CMO before and it sound like a really interesting ingredient. I would very much like to try it, however I’m currently taking Rapamune- an immune suppressant – following the rejection of my corneal transplants. I spoke to my ophthalmologist about it but he’s never heard of CMO and cautioned me against it. I suffer from chronic hip pain (more so since I’ve been taking the immune suppressant). My question is- are there any contra-indications for taking CMO whilst on an immune suppressant? My thinking was that the CMO would not only assist in the joint pain but may also arrest the T-lymphocytes that are attacking the foreign corneal tissue thus allowing me to reduce the dose of this ghastly medication I need to take. CMO is an immunomuodulator; that is it tends to ramp up a weak immune system, but throttle back an overly aggressive immune system. For that reason, it could interact with an immunosuppressant drug, making its effect less predictable. Work with your physician. This article is very informative , There are some valuable formula has exit so I think Its helpful everyone . I like this Article so very. I like this Article so much. This is really very informative..thank you! Being that this formulation has been shown to be beneficial for certain auto-immune diseases such as rheumatoid arthritis, is there any anecdotal or clinical evidence to suggest that other auto-immune disorders in particular, those suffering from Raynaud’s Syndrome might experience some relief? We have not heard from anyone using this formula with Raynaud’s Syndrome. If you try it, you will be the first and will be able to share your experience. I already include ginger in my healing-intended diet. Avocado, I have gone back and forth on (currently have several in the fridge going off), and typically get much of what I use them for, from hemp, and other seed oils and nuts. The mention of glucosamine did give me pause to reconsider, having experienced a worsening of raynauds while on it. And I no longer care what goodies anyone says is in soy. There’s no way I’ll ever willingly knowingly take any soy again, knowing what I do now about the proper way to consume it (fermented, small doses, condiment, organic), and how the vast majority (>99% iirc) is produced (monsanto’s genetically engineered to tolerate greater saturation in poisonous pesticides). But the rest of that… does sound worth giving a go to help deal with raynauds. As easy as this is to say on a hot day in summer, I think I’ve got my raynauds mostly under control now, using a combination of thermogenic herbs n spices, various insights and practices from ayurveda and the gerson protocol, and many important vitamins (B vitamins most especially, specifically inositol hexaniacinate, and methylcobalamin), and of course, ginkgo biloba. I’ve yet to put this to the test also, but I have a growing suspicion that nightshades (and aliums) may also be to blame for worsening raynauds (and other autoimmune disorders), though I bear in mind that’s quite a broad brush to paint with, so to speak, and that there may well be exceptions… like ashvagandha, which seems to have some very nice adaptogenic and other beneficial properties. I thought I should add that in case it’s of benefit to those with arthirits too, or even to other raynauds sufferers who found their way here through a websearch thanks to those last two comments.